"41HS3, Extra-34" by Timothy K. Perttula and Robert Z. Selden Jr.
DECORATION (INCLUDING MOTIF AND ELEMENTS WHEN APPARENT): The rim panel has six sets of engraved continuous scrolls (vertical-diagonal) with upper and lower scroll fill zones. The scroll fill zones have negative oval elements defined by vertical excised brackets. The vessel body has two stacked horizontal panels divided into 14 different rectangular sections by single vertical engraved lines that end in hatched or open pendant triangles. Each of the rectangular sections has a single linear excised punctate element. Ripley Engraved, cf. var. 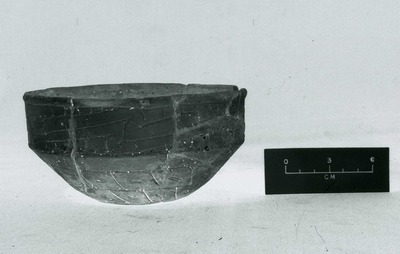 Carpenter carinated bowl (Extra-34) from the H. R. Taylor site.